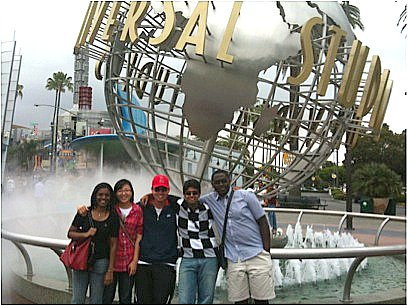 Computer science students from India, Switzerland, SJSU and CSU Long Beach take a break from summer studies to see the sites including Universal Studios (photo by Rafael Alvarez-Horine). Where do you go to meet people from abroad, experience cutting edge technology in your field, and earn course credits? “Summer University,” an innovative program hosted this year by California State University, Long Beach for computer science students from colleges in Switzerland, India and the United States, including SJSU. The Swiss Board of Higher Education of the Canton of Vaud created the program as a way to help students cultivate cultural exchanges and establish international professional connections for future collaborations, said Jon Pearce, chair of SJSU’s Department of Computer Science. Students earned units from classes on topics including programming, multiprocessor processing, and artificial intelligence. Swiss and U.S. professors taught the courses, including SJSU professors Soon Tee Teoh (computer graphics applications) and Cay Hortsmann (Scala, a modern multi-paradigm programming language designed to express common programming patterns in a concise, elegant, and type-safe way). Summer University has also been held in Switzerland, Mexico, Singapore and India, and has focused on all kinds of disciplines including business, enology (study of wine), health care and education. In addition to classes, the program offers company visits, guest speakers from industry, and cultural activities. Computer science grad Ralph Alvarez-Horine was one of three SJSU students who participated this year and blogged about his experiences while at CSULB.